The International Ecotourism Society (TIES) is a nonprofit organization dedicated to promoting ecotourism. Founded in 1990, TIES has been on the forefront of the development of ecotourism, providing guidelines and standards, training, technical assistance, and educational resources. TIES’ global network of ecotourism professionals and travelers is leading the efforts to make tourism a viable tool for conservation, protection of bio-cultural diversity, and sustainable community development. Through membership services, industry outreach and educational programs, TIES is committed to helping organizations, communities and individuals promote and practice the principles of ecotourism. TIES currently has members in more than 190 countries and territories, representing various professional fields and industry segments including: academics, consultants, conservation professionals and organizations, governments, architects, tour operators, lodge owners and managers, general development experts, and ecotourists. Ecotourism is defined as “responsible travel to natural areas that conserves the environment and improves the well-being of local people.” (TIES, 1990). Using TIES’ definition and principles of ecotourism as guidelines, we continue to serve as an unbiased source of information and resources on ecotourism. TIES promotes ecotourism – “responsible travel to natural areas that conserves the environment and improves the well-being of local people” – through membership services, education and training, and global outreach and partnerships. 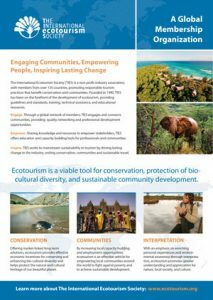 The Ecotourism Society (later to become The International Ecotourism Society) was founded in May, 1990, and helped develop the first definition for the concept of ecotourism that incorporated sustainable development ideas.